On 26.09.2011, the Ghana Football Association published the squads for the GLO Premier League 2011-2012. In this post, I will make some comments about one of the relegation candidates this season, Mighty Jets FC from the Ghanaian capital of Accra. Mighty Jets FC has lost their two most important players during the summer in playmaker Aaron Amoah (to AshantiGold SC) and captain Richard Ofori (to Sporting de Charleroi, Belgium). It is difficult to see that these players have been replaced with players of the same quality. * Mighty Jets FC still has several interesting players and they have also made some decent signings before the new season. The experienced Hassan Mohammed, formerly of Hearts of Oak SC and Real Tamale United FC, is comfortable both in central defence and at the full-backs. He will most likely become a valuable member of the team. 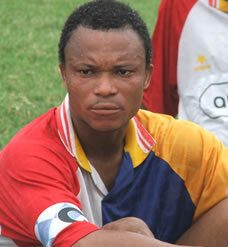 The picture is of Mohammed and is taken from Ghanasoccernet. * Most of the new signings are somewhat difficult to identify but I believe that Bright Akoto and Issahaku Shaibu are former goalkeepers of Wa All Stars FC, that Raphael Okyere is a former striker of Wa All Stars FC, and that Kofi Asiamah is the attacker Kofi Asiamah who was a fringe player at Hearts of Oak SC last season. Isaac Klevor is an interesting left-back / centre-back and a former member of the well-run Right to Dream Academy. * Mighty Jets FC has been linked with Hearts of Oak SC midfielder Yufa Zugah (born 01.08.1989) but I am not sure that this deal has materialized yet. There have also been rumors regarding experienced central defender Daniel Coleman during the summer. I have a theory that Mighty Jets FC could have signed some players who are not listed at the official squad published at the Ghana Football Association. Abdalah Razak, Gafaru Abdul Yakubu, Michael Acquaye, Kamaru Dini Adu Addo, Ismeal Akwasi Afriyie, Jacob Amissah, Foster Anim, Ernest Antwi, Isaac Asante, Yaw Owusu Asante, Elvis Kwadwo Asare, Victor Azumah, Henry Benefour, Stephen Frimpong, Isaac Essilfie Ghartey, Peter Hem, John Henyo, Musah Inusah, Benjamin Malik, Mathias Mensah, Eric Mkansah, Ali Nasiru, Obed Nkansah, Abdulai Osman, Raphael Okyere, Elijah Aseidu Otchere, Mustapha Sumaila, Salim Waham.